In the equine world, an animal measuring 14.2 hands at the withers and under is a pony. Any equine measuring more than 14.2 is a horse. The average size of a horse is approximately 15.2 hands. However, that's not the average for all horses in all breeds and disciplines. As the saying goes, "Horses for courses," meaning that equines were bred for a certain size and a particular physiology to accomplish specific tasks. Equines are measured in hands, with each hand constituting 4 inches. That means the average horse standing at 15.2 hands stands 62 inches tall at the withers, or just about 5 feet, 2 inches. Determine your animal's height using a measuring stick or tape from the bottom of the hooves to the withers' top. Place your horse on a level surface when measuring him. Ponies are divided by height into categories of small, medium and large. For competition purposes, a small pony can't exceed 12.2 hands in height, and a medium pony ranges from 12.3 to 13.2 hands. A large pony ranges from 13.3 to 14.2 hands. Some well-known breeds of horses usually mature just about or slightly under the average size. These include the quarter horse -- one of the breeds with the highest annual registrations -- with an average height of 59.3 inches, and a range of 57 to 61 inches tall. The Morgan averages 60 inches, ranging between 56 and 63 inches tall. These two breeds originated in America, but a third average-sized breed did not. The Arabian averages 59.7 inches, ranging between 56 to 63 inches tall. Two racing breeds are generally taller than the typical horse, although plenty of them are "average" size. The thoroughbred grows to an average height of 63.78 inches, or about 16 hands, with a range of 62 to 68 inches or more. The standardbred, used for harness racing, averages about 63 inches tall, with a range of 60 to 66 inches or more. Various warmblood breeds, often used as sport horses in dressage, show jumping and eventing, are the tallest of the equines used primarily for riding. The Danish warmblood ranges from 16.2 to 17 hands tall, or 66 to 68 inches, while the Holsteiner stands between 16 and 17 hands in height, or 64 to 68 inches. The Oldenburg ranges between 16 and 17.2 hands, or 64 to 70 inches. Draft horses, the heaviest of all equines, also boast taller average heights. These "gentle giants" are true workhorses, capable of pulling enormous amounts of weight. The Belgian, among the most common draft horse breeds, averages 16 hands when full grown. 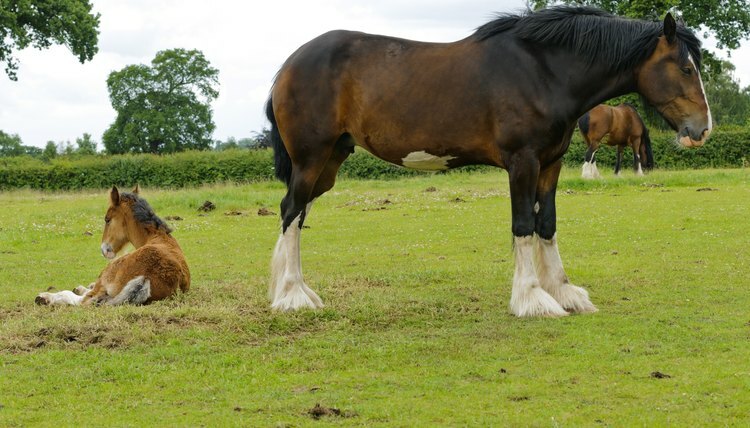 The Percheron averages 16.2 hands, while the Clydesdale averages about 16 to 16.1 hands. The Shire, the tallest and heaviest of the draft breeds, averages 17 hands, with many nearing the 18 hand mark.